What's your favourite antenna for portable activity? Re: What's your favourite antenna for portable activity? Either a 6m vertical made out of a fishing rod OR top corner fed half-square for the band in question. I recommend for everyone to try out a half-square!! I use a buddipole setup with an MFJ 1979 17' whip. With the coils, I can tune easily on 80m-40m. Without the coils, I can tune 20m-6m. I use the 17' whip as vertical and two shorter buddipole whips as radials. I have used a longer wire for a radial on 80m-40m. I use the setup to operated from beach trips over weekends, and when in Aruba (P40DE) last summer. I operated QRP with the KX3. For outdoor I use home made - VP2E, END FEDZ EF-20, END FEDZ EF-10/20/40 and long wire with tuner Elecraft T1. Hi, I have a Buddipole for 2m to 40m bands. Adjustable for differents configurations: NVIS, vertical dipole, orizzontal dipole, V dipole or 2 elements in 2m, 6m, 10m. I have also a Yaesu ATAS25 used with a tripode. Feet in England heart in Ireland. Éirinn go Brách! 20 years ago, 1/2 size G5RV, now a simple doublet; both inverted V, both supported by glass fibre pole. If weight/size is a problem, 10m hookup wire terminated with 9:1 unun --->>small tuner. This is multiband and can be hung with whatever comes to hand. My favourite antenna is the one with me when I want to operate!! My portable ant is home made 3 bands (80-40-20m) Inverted V with 2 jumpers on each legs and 15ms of RG58 coax. 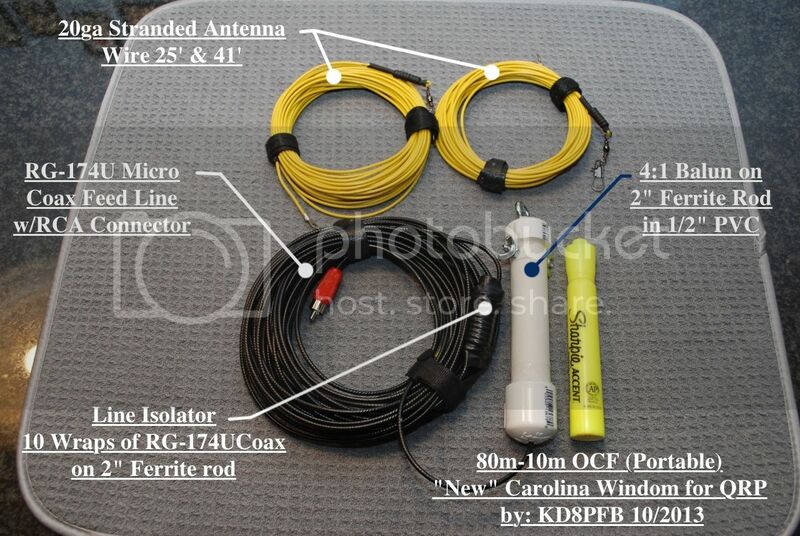 My current favorite QRP antenna is a 40m New Carolina Windom with a 10' vertical radiator. The antenna is 20ga stranded wire and the radiator & feedline are a continuous 35' length of RG-174U micro coax with an RCA connector on the end. The radiator/feedline are interrupted at 10' down from the 4:1 balun, with 10 wraps of coax around a ferrite rod as a line isolator/1:1 balun to impede RFI to the radio. It all fits in a 1-quart freezer bag for backpacking. Here is the 4:1 balun that is housed in the PVC tube. 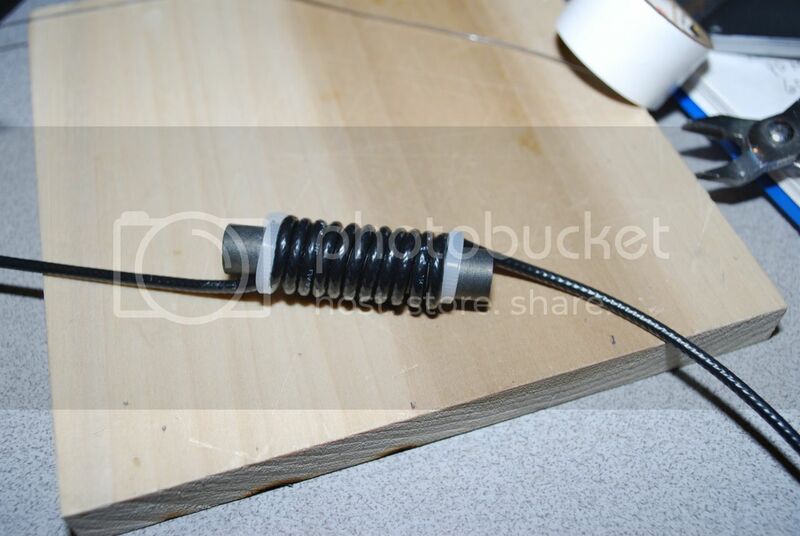 The feedline is knotted inside the endcap of the tube, then soldered to the balun for sturdiness. Here is the line isolator/1:1 balun at 10' down from the 4:1 balun. I use homebrew vertical 40-20m antenna, 4 radials. Excellent for working in QRP, SOTA and Field Day. I have several "SOTA" type antennas and each has it's use. My favorite is probably an LNR EF-10/20/40 with a 7 meter carbon fiber telescoping fishing pole. I can lash the mast to a tree/fence/quad/rock outcropping. I can use 2 small guy strings and the wire to hold it up if nothing is available. Set up time is about 5 minutes. It always performs well. I also use the EARCHI EF antenna the same way. This is nice because you can use 100 watts. The LNR is limited to 25 watts. My unscientific opinion is the LNR works better. when there are no trees or rocks to easily put up a mast. I love the SotaBeams Band Hopper II. It just takes a bit longer to set up and weighs a bit more. for me. I also use it if I'm setting up for a multi-day campout. I usually use a Jackite 10 meter mast. in more than a mile or two. I don't think any of those antennas have disappointed me. I've had good results with them all. It's just a matter of what your environment is like and how much you want to pack in. Hi All, I use EFHWA in my QRP activity but I design new Short Vertical antenna with suspend radial similar to Buddy Stick. 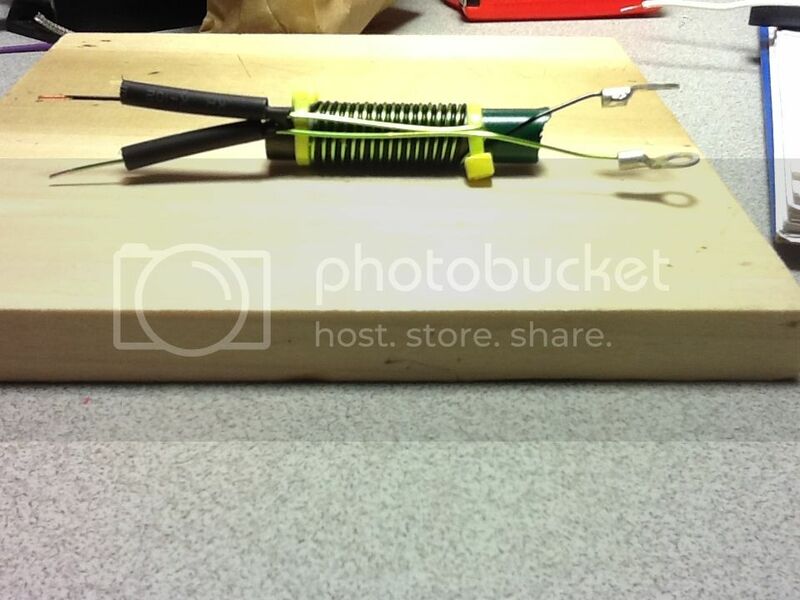 Here is a link of my project and a picture of antenna. My favourit QRP Hollyday antenna is the Buddistick!! I am using and like windom from 20 mt to 10mt using tuner Z817. Me and my Rybakov (10 mt). For easy /p I've found that my Transworld Traveller 2010L works very well. 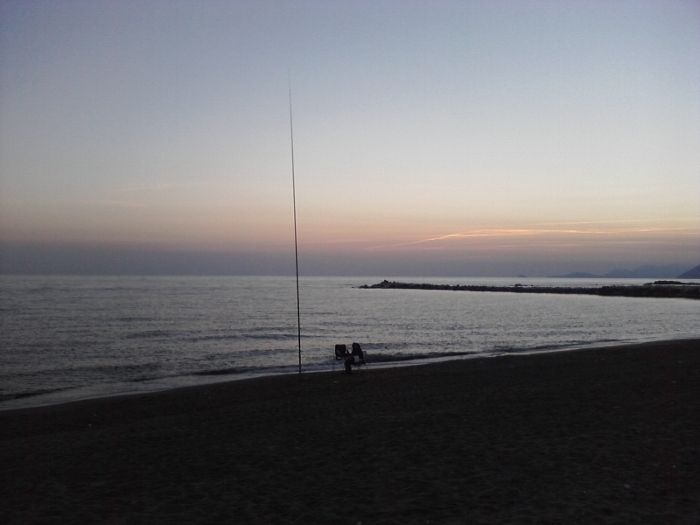 All I need is my FT-817nd with 10mtrs of coax and the above antenna. Everything fits into the antennas supplied carry bag. Set up takes less than a couple of mins.